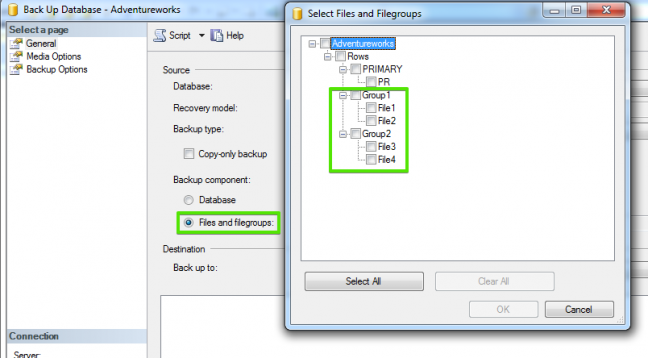 SQL Server allows to make backups and restore not only the entire database but also a single filegroup or even a separate file. This is called a file backup. This type of backup contains all data from one or more files or filegroups. File backups are often used to increase the recovery process speed by restoring only damaged files, without restoring the rest of the database, if necessary. Assume there is a database that contains several files. Each file is stored on a separate disk and suddenly one disk fails. In this case the recovery process will not take more time because there is no need to restore the entire database, it will be enough to restore only the file from the failed disk. Another use case is when some filegroups in your database are updated more frequently than others. In this case you can backup them separately using a file backup. One of the biggest disadvantages of using file backup is that such backups are difficult to manage. It takes more time to manage every file backup separately. Also, if failure occurs and the backup of the damaged file is lost the entire database becomes unrecoverable. Let’s explore how does full file backup work under different recovery models. 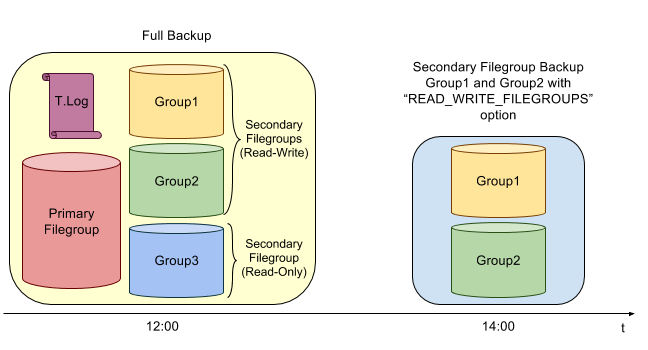 Assume there is a database “Adventureworks” which contains two filegroups “Group1” and “Group2”, each filegroup includes two files “File1” and “File2” for filegroup “Group1” and “File3” and “File4” for “Group2”. 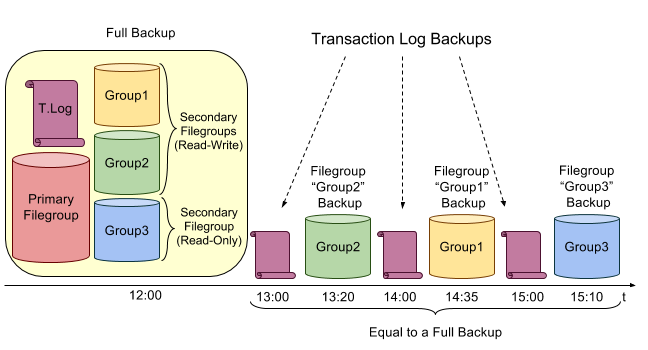 Note though, that using this backup strategy leads to a complex database restoration process. If any file is offline then the whole filegroup containing this file is offline too and cannot be backed up. SQL Server backups only one file at a time. Of course, it is possible to backup multiple files in one operation, but should you need to restore only one file, the restore operation will take more time (to find the file, the whole backup will be read).